Dog games is a large book full of lovely photos. It explains how to start playing with your dog, what safety things to think about and how to motivate your dog to start playing in the first place. I thought the introduction was a little long, I was keen to 'get started with the games' and I found the menu system a little confusing but I got used it after a while. There is some fantastic general advice like using two balls to swap rather than insisting on the dog dropping the first item, but I did think it could be organised better. I would prefer a couple of chapters on 'how to' teach and play games in general, then keep the games to just instructions to prevent too much repetition. There are some nice ideas, like using a cardboard box with the top and base folded in as a tunnel, and some really fun suggestions such as using the lead as a skipping rope for you and your dog to jump together. Other games, such as teaching them to push a towel around the floor, are even practical! However, there are some games that I wouldn't want to teach my dog, such as taking 'washing' off a fake line (to me, this is just asking for trouble!). A lot of the games seem to be variations on a theme - hide treats under yoghurt pots, hide treats in your clothing, hide treats under a bowl, hide treats under newspaper etc, which I felt could have been described as one game with variations simply listed. However, in other sections, games described as "variations" seemed, to me, to be different games. The jumping over an umbrella task has a 'variation' of putting the umbrella up and hiding a treat behind it. Throughout the book, though, you find great little 'gems' of ideas such as floating bowls with treats in a paddling pool and encouraging the dog to lift out the pot in order to get the treat. 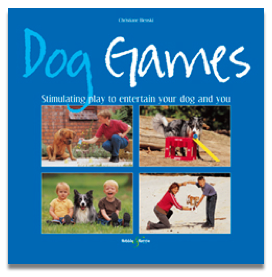 There are a number of very good books referenced throughout Dog Games, and it even touches on behaviour and TTouch. The entire book encourages the reader to work 'with' their dog, rather than insisting on regimental obedience, and encourages a respect towards our canine playmates. So, in general, I would say that this has some fun ideas for anyone starting out in training and playing with their dog.